Ranulf from Fire Emblem: Path of Radiance and Fire Emblem: Radiant Dawn has been read as a gay character, particularly as a potential love interest for Ike, though the relationship is not nearly as strongly implied as it is for Ike and Soren. 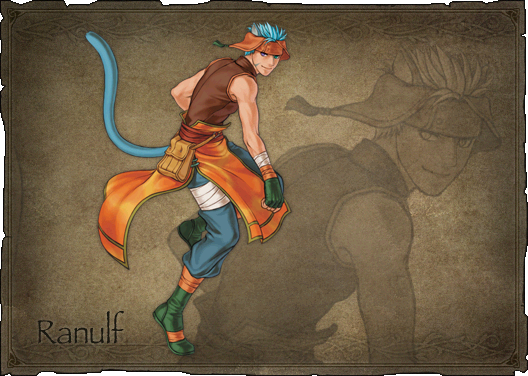 Ranulf is one of only two characters (the other being Soren) whose ending in Fire Emblem: Radiant Dawn changes if he has an A-level support with Ike, whereby he disappears from his home to explore the world. It is implied that he travels with Ike, who also leaves to travel the world. If Ranulf dies over the course of the game, his last thoughts are of Ike. Furthermore, the books Fire Emblem: Path of Radiance Memorial Book Tellius Recollection: The First Volume (2016) and Fire Emblem: Radiant Dawn Memorial Book Tellius Recollection: The Second Volume (2016) makes frequent references to Ranulf having special trust in, interest in, fondness for, or a special bond with Ike. (for example, Vol. 1 p. 192 and Vol. 2 p.102). Nintendo/Intelligent Systems. 2016. Fire Emblem: Path of Radiance Memorial Book Tellius Recollection: The First Volume. Tokyo: Tokuma Shoten (ambit). Nintendo/Intelligent Systems. 2016. Fire Emblem: Radiant Dawn Memorial Book Tellius Recollection: The Second Volume. Tokyo: Tokuma Shoten (ambit). This entry was posted in 2000s, Characters, Games by Decade, Gay, Gay (implicit), Playable Character, Queer Men on February 10, 2017 by Adrienne Shaw.